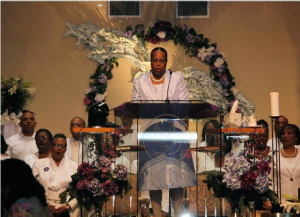 Reverend Sylvia E. Sumter is currently the Senior Minister of Unity of Washington, DC. Prior to her tenure in Washington, DC, she served as the Chairperson of Communication Studies and Skills Department for the Unity School of Religious Studies, in Unity Village, Missouri. As a member of the faculty, she taught in the Ministerial Education Program and in the Continuing Education Program. She was licensed as a Minister in 1986 and ordained as a Unity Minister in 1987 as a graduate of the Unity School of Christianity. She has also spoken and administered spiritual teachings to others through her work prior to, during and after ministerial school. Reverend Sumter’s academic accomplishments include: a Masters of Education, a Bachelor of Arts in Psychology and an Associate of Arts in Business Administration. She is a natural, gifted teacher who spent the early part of her career as a professional counselor in institutes of higher learning. She served as the Director of Higher Education Opportunity Program at Onondaga Community College in Syracuse, NY. Prior to that experience, she served as the Assistant Director of the Higher Education Opportunity Program at Syracuse University. The work she is doing in her life has had an extraordinary effect on so many here in Washington, DC and every place that she travels to speak and to teach. She has traveled extensively around the country conducting workshops and seminars, and has served as a guest speaker for many churches, institutions of higher learning, professional and business organizations. One of her most notable characteristics is her dynamic and energetic speaking style, yet she has such an unassuming manner. Many people have told her that it feels as if she is speaking directly and exclusively to them. Through her work as a minister and professional counselor, she continues to teach and to help others expand their spiritual consciousness and vision by living in the awareness of God through prayer, meditation and practicing the principles of living life in Truth. Reverend Sumter is also noted for her uncanny ability to take the most fundamental teachings and principles of spirituality, and many of life’s experiences to develop her messages. Her call is to inspire individuals to transform their lives through an awareness of their innate divine potential. She is a native of Brooklyn, New York, and she enjoys the game of golf and traveling.